The very best art school is not a school at all. 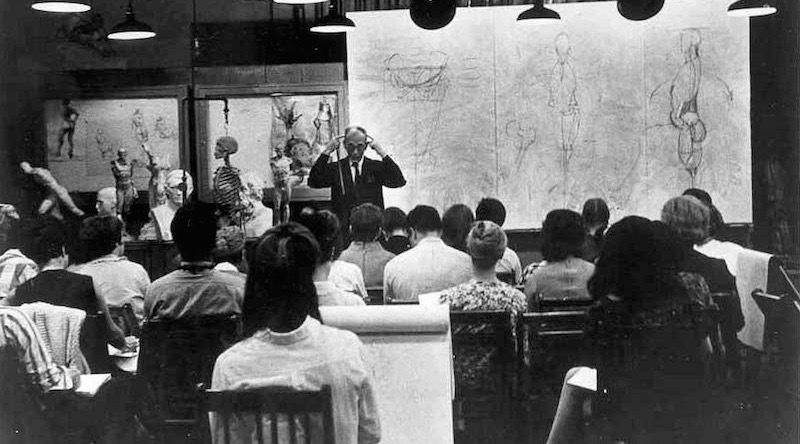 What’s the best art school in the world? There are many great art schools today for whatever style or discipline you would like to pursue. 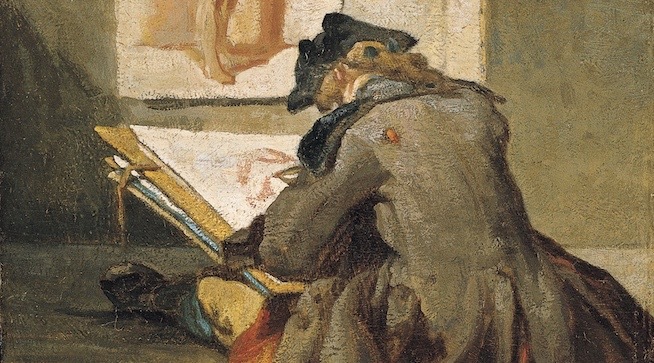 Some, like the Art Students League, are better at teaching traditional skills, while others, like university programs, emphasize creative thinking more than any sort of technical prowess. To my mind, the best schools aren’t necessarily the ones that offer degrees, though it’s a serious disadvantage to lack one. But there is a school in New York City that is the very best place to study art, and it’s not a school at all. It’s a museum: the Metropolitan Museum of Art. The masters are all there to instruct you, though their voices are silent. They speak to us in images and teach by example. They may simply inspire you, or they may provide some very solid instruction. Sometimes I visit the Met with a specific question in mind. I may focus on light and color, other times on composition or brushstrokes. More often, I just try to stay open to what I am seeing and what I can learn. I strive to take away at least one lesson each visit. Here are five of my Met takeaways. Rembrandt van Rijn, Herman Doomer, 1640. Oil on wood, 29⅝ x 21¾ in. H. O. Havemeyer Collection, Bequest of Mrs. H. O. Havemeyer, 1929. The Metropolitan Museum of Art. Sir Thomas Lawrence, John Julius Angerstein, Oil on canvas, 36 x 28 in. Bequest of Adele L. Lehman, in memory of Arthur Lehman, 1965. The Metropolitan Museum of Art. Rembrandt van Rijn, Self-Portrait, 1660. Oil on canvas; 31⅝ x 26½ in. Bequest of Benjamin Altman, 1913. The Metropolitan Museum of Art. One evening I studied the way Rembrandt painted eyes over the course of his career. How did he create that interior psychological portrait that makes us feel comfortable staring at the subject, drawn into an experience with the sitter? I noticed that the way he painted eyes changed as his mature style developed. The later portraits have very wide-open pupils and are very soft, very inviting. They seem unfocused in a way that eyes are when someone is lost in thought. The earlier portraits don’t have this quality. The eyes are very focused and bright with smaller pupils. 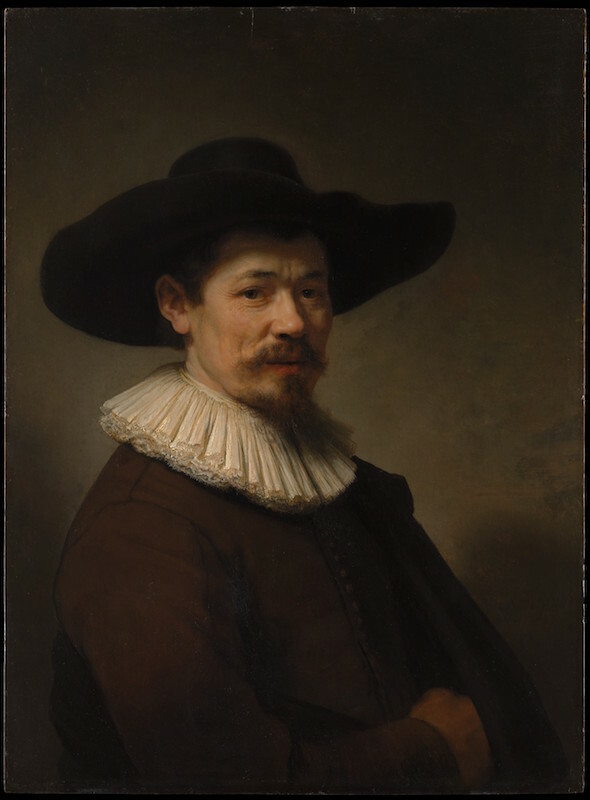 Observe Rembrandt’s brilliant portrait Herman Doomer from 1640. Everything is tightly rendered with almost equal attention. We seem to be meeting Herman Doomer, all details are presented to us equally, and he meets our gaze directly. 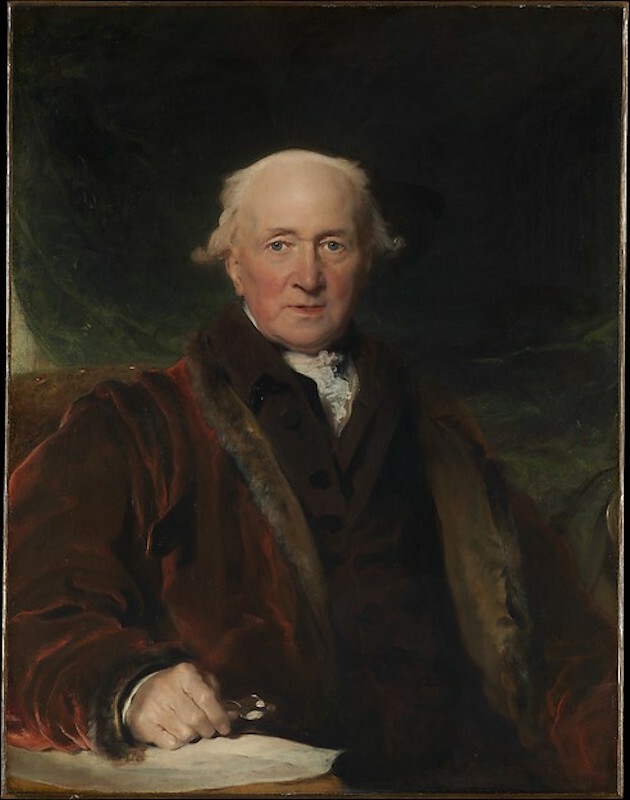 Thomas Lawrence’s portrait John Julius Angerstein (1816) used to hang in an adjoining gallery to the Rembrandts. I was struck at the fierceness in the eyes of the Lawrence. They are very sharply painted with small brightly-lit pupils and are quite confrontational. Rembrandt’s Self-Portrait (1660) and the pendant portraits of Woman with a Pink and Man with a Magnifying Glass from the 1660s are very different indeed. With their warm welcoming eyes the Rembrandts put me in a thoughtful frame of mind contemplating the subjects. The Lawrence set me back as I would if I had encountered a person starting pointedly at me. The subjects of the more conventional portraits seem to say, “Here I am,” and in a late Rembrandt, the artist seems to say, “There they are.” The conventional portraits present the subject to us; the Rembrandts reveal them. Some subjects seem aware of us, some not. Both are wonderful, but the effects are quite different. The less aware the subject is of the audience, the more we are invited to see them. 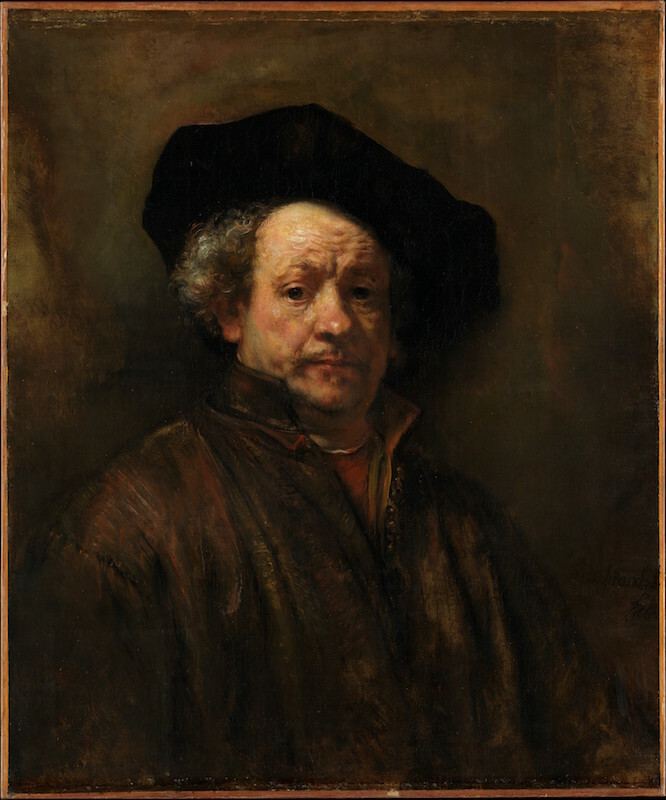 Rembrandt’s self-portrait is even more complex. His expression seems simultaneously aware of us and lost in thought. I think he wanted to record, not so much his likeness, but how his life read on his face. The eye on the shadow side, without the highlight is more inward looking, the other eye with the highlight more aware of the audience. 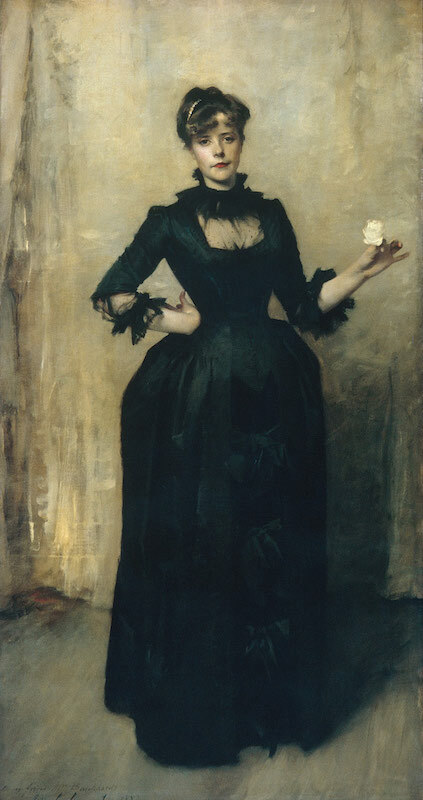 John Singer Sargent, Lady with the Rose (Portrait of Charlotte Louise Burckhardt), 1882. Oil on canvas, 84 x 44¾ in. Bequest of Valerie B. Hadden, 1932. The Metropolitan Museum of Art. I thought that I had better pay much closer attention to the manner in which I paint eyes. I could create very different portraits of the same individual just by manipulating the edges around the eye, the pupils, and the amount of light I let fall on them. Another of my favorites at the Met is John Singer Sargent’s Lady with the Rose (Portrait of Charlotte Louise Burckhardt) (1882). There are many reasons I love this portrait: the sheer virtuosity of it, the color, the brushwork, the warmth and beauty of the subject that lives on in paint. A very practical lesson it taught me, however, was how to paint something sheer like the lace on Burkhardt’s bodice. It is so completely convincing as a sheer fabric that you could imagine Sargent laboring for days to achieve the effect. On closer inspection you see that it is simply a few dots and strokes of black floating on a delicate, barely perceptible glaze over the flesh color. The economy of means is absolute poetry. Henri Fantin-Latour, Still Life with Flowers and Fruit, 1866. Oil on canvas, 28¾ x 23⅝ in. Purchase, Mr. and Mrs. Richard J. Bernhard Gift, by exchange, 1980. The Metropolitan Museum of Art. A similar lesson in optical blending is easily learned at the other end of the museum in the wonderful still lifes of Henri Fantin-Latour. His Summer Flowers (1880) or Still Life with Flowers and Fruit (1866) will draw you in from a distance with a mesmerizing mastery of detail, especially in the flowers. Yet, approach closer and something happens; you really start to see the paint. Anyone who wishes to be a painterly realist must look at these paintings. The detail is an artful optical illusion. You can barely make out the petals at all when you’re close to them. The flowers are masses of thick textured paint so perfectly placed as to create the perfect illusion of delicate petals. 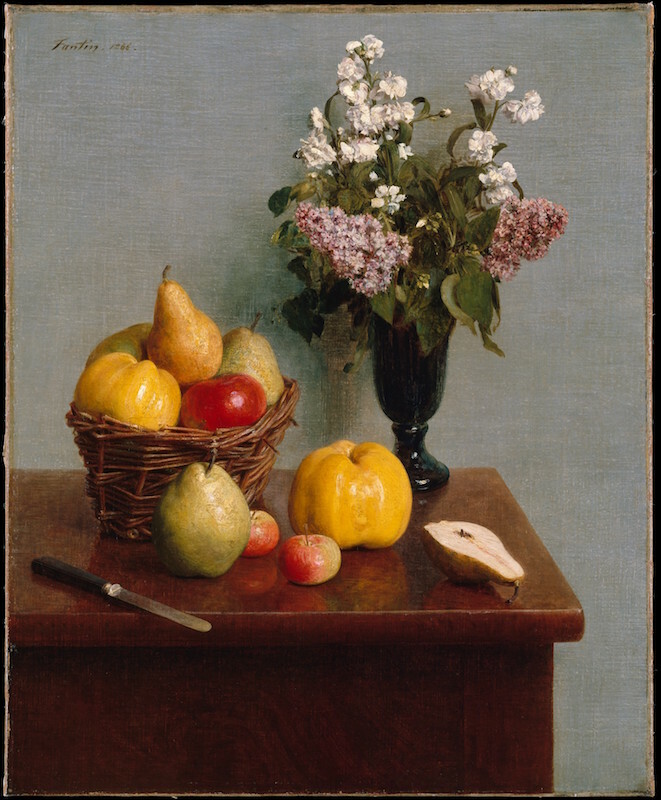 Reproductions of Fantin-Latour’s still lifes can seem remarkably photo-like, but they are richly textured and so much more colorful than many an impressionist. The lesson is the possibilities of impasto and how our eyes will process it at a distance. None of these observations can be fully appreciated without seeing the real thing. Edgar Degas, The Dance Class, 1874. Oil on canvas, 32⅞ x 30⅜ in. Bequest of Mrs. Harry Payne Bingham, 1986. The Metropolitan Museum of Art. Compositional design is something that really enhances my enjoyment of a painting. The Met is replete with examples to study. Edgar Degas’s The Dance Class (1874) taught me how to use color to move the eye through a composition. Degas painted several versions of this image, always tinkering with the composition. The Met’s version has soft green-grey walls at the back of a group of dancers practicing under the watchful eye of the dance master whose hands rest atop a staff. The palette is largely neutral, the green dominants. 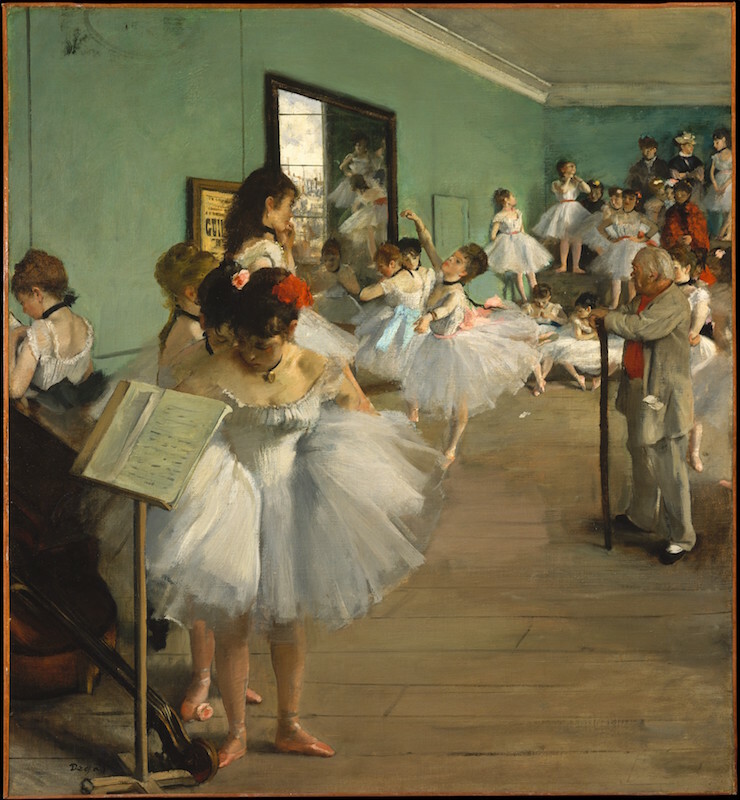 Degas then places red rhythmically throughout the composition, vibrating against the complementary green. The dancer in the foreground has a red flower in her hair and the dancer just behind her helping her with her dress has a flower with a red note within its petals. There is glimpse of a red sash of a dancer reflected in the large mirror on the wall and a chaperone in back of the studio has on a red shawl. The dancers wear soft pink dance slippers. Finally, the dance master himself has on a red shirt under his jacket. The red notes pull our eye in a graceful arc around the composition. Degas has some brilliant linear movement, actual and implied, manipulating our eyes as well. It is clear that Degas was as interested in the abstract design of his image as he was in the subject itself. Adriaen Brouwer, The Smokers, ca. 1636. Oil on wood, 18¼ x 14½ in. The Friedsam Collection, Bequest of Michael Friedsam, 1931. The Metropolitan Museum of Art. 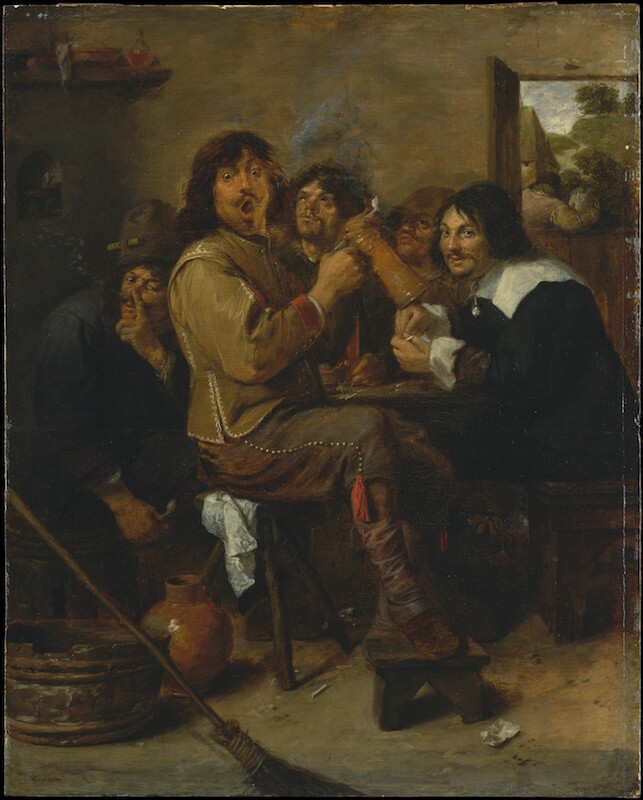 I can’t resist a brief mention of Adrian Brouwer’s The Smokers (1636). It is a perfectly balanced composition that would collapse without the inclusion of the broom in the foreground that is parallel to the uplifted bear mug in Brouwer’s hand (it’s a self-portrait with his painting buddies). The broom is a vital part of the linear movement that activates the entire composition. Nothing is superfluous in this seemly informal scene. Great artists design their images very carefully. It is something I largely missed in my years painting at the league. The Met taught me. William Orpen, Self-Portrait, ca. 1910. Oil on canvas, 40⅛ x 33⅛ in. Gift of George F. Baker, 1914. The Metropolitan Museum of Art. 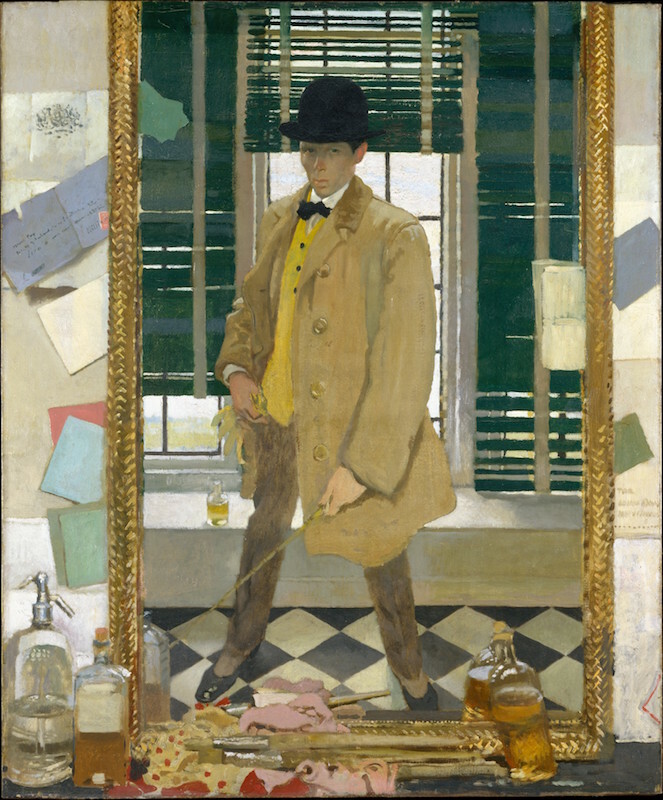 My last compositional lesson comes from Irish painter William Orpen’s 1910 Self-Portrait. He stands full length, legs apart, in a derby hat, light brown coat, yellow waistcoat, and bow tie holding a mahl stick. Dark green venetian blinds are behind him; horizontal slashes of light break through between the slats. He stands reflected within a gold framed mirror within the frame of the canvas itself. The mirror is tilted so we look slightly down on him showing the black and white tile floor he stands upon. Outside the mirror’s frame we see the mantel it rests upon with bottles of a golden liquid in the foreground. Brushes lay below the mirror and a seltzer bottle is to the left. It makes me wonder whether the other bottles are linseed oil or liquor. Either is plausible. An incredible combination of horizontals and verticals activate the composition with the diagonals of the mahl stick, the floor tiles, and the various letters stuck behind the mirror visually crisscrossing each other in a symphony of linear movement. It’s the same lesson as the Brouwer; it takes thought to make an image like this. Composition doesn’t just happen. Compose is a verb. There is a great pleasure to be had in seeing this type of visual design, just as there is in the understanding of the orchestration of a great piece of music. 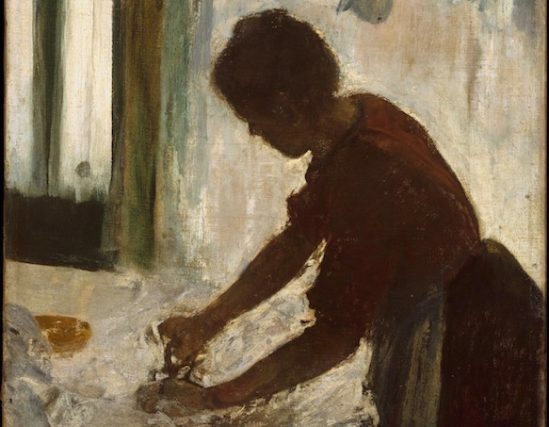 It is no secret that long before the age of total abstraction, representational artists were great designers of the abstract elements of their images. Yet, in art school it is easy to get totally caught up in accurate drawing, form, and light at the cost of design. The Met taught me to look deeper into the construction of an image. I’ve had many lessons at the Metropolitan Museum of Art. The more I learn, the more I see. I suppose you don’t really ever graduate from a school like this, no matter how mature an artist you become. As with all great teachers, the Met never dictates or restricts, it just keeps sharing.